A cultivar of Camellia japonica L. The double flowers are up to 8cm across and crimson-red in colour, resembling the flowers of a double Hibiscus. [Don, ICR]. ‘[This] fine variety is one of the first kinds which were introduced into this country [from Japan] by Sir Robert Preston about the year 1798. Although it is one of the most estimable kinds, it has not been generally so much encouraged as the others: the reason seems to be that it does not flower so freely when young.’ [LBC no.397/1819]. It was probably first figured in Andrews’ Botanical Repository. [ABR pl.199/c.1801]. Listed in all published catalogues [T.258/1843]. Plants were presented to the Sydney Botanic Garden on October 24th 1846 [RBGS AB]. ‘Rubra plena’ was marked ‘+ C’ in an article by ‘G.A.L’ in the Horticultural Register, indicating that it was grown at Camden but was not new to the colony. 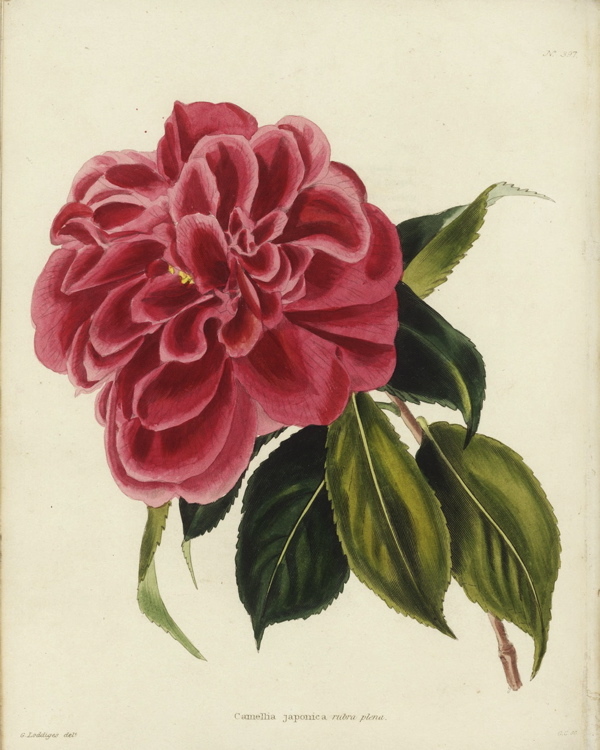 Although this book originally belonged to James Bowman, this may indicate that ‘Rubra plena’ was grown by the Macarthur family earlier than 1843. [HR p.633/1832]. Walter Hazlewood found three plants of ‘Rubra plena’ at Camden Park in the 1930s. [TJSC].